It is a peculiarity of the 21st Century movie star that they feel they can diversify into other fields of artistry without, it seems, any grasp that people aren’t always good at everything. Thus, it is not uncommon now for actors to star in a few films, turn their hand to directing and even make records. George Clooney, Kevin Costner, Ben Affleck and Kiefer Sutherland are just four names who have made the transition (or rather leap) to directing, Steven Seagal one name who has branched out into music. Once this simply was not the case- actors knew their place, and were humble enough to stick to doing what they did best. Therefore, we can only surmise at what a Cary Grant directed film would look like, or what the over-riding themes of Gary Cooper’s films would be. Of course, as with most rules, there were exceptions. Charles Laughton’s solitary venture behind the camera for Night of the Hunter (1955) is now considered a triumph, though it was not praised at the time. Burgess Meredith also took a brief turn behind the camera (replacing Irving Allen, reputedly at Charles Laughton’s behest) for The Man on the Eiffel Tower, an RKO curio from 1949. 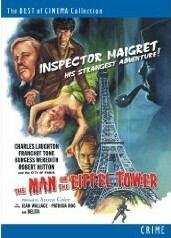 Usually, a studio system film would not merit the “curio” tag, but The Man on the Eiffel Tower certainly does. Shot in ANSCO Colour (the European equivalent of Technicolor), the film captures post-war Paris in fascinating (if rather fragmentary) fashion. Indeed, the move out of the studio backlot and onto the streets of Paris has an unusual effect, and it is this, allied to the colour film stock, that gives The Man on the Eiffel Tower a rather exotic aspect. (It is worth noting that the importance of the city itself is recognised in the opening credits- it is listed in a frame on its own along with the actors). One of the other reasons the film is such an oddity is in its casting. Inspector Maigret is played by the (miscast) Charles Laughton, who strikes an uneasy balance between Henry VIII-style over-bearing-ness and that of a bewildered bystander. Johann Radek is portrayed by Franchot Tone (a mainstay of 1930s films but now, in his mid. 40s, finding major film roles impossible to procure). The pair are ably supported by Burgess Meredith (who should really have stayed in front of the camera) and less ably by a range of other stars and starlets who fight wooden dialogue and leaden direction with admirable- if futile- spirit. Given this offbeat mix of cinematic ingredients, The Man on the Eiffel Tower could have been something much, much better if it were in the hands of an experienced director such as Hitchcock or practically any of the émigrés who made such atmospheric Noirs in the 1940s and 1950s. Given its many shortcomings, should The Man on the Eiffel Tower be valued? Surprisingly, my answer would be ‘yes’. Unlike many films which have very little points of interest, this little film has several- even if they are not particularly well executed. If nothing else, the use of the (now faded) ANSCO colour process makes it a necessary piece in the jigsaw in the technological development of cinema, the rather bizarre performances combined with the unusual use of location filming adding to the tapestry of a film which, thanks to Odeon Entertainment, is freely available once again.